Prone vs. Supine – What’s the Difference? Home » Prone vs. Supine – What’s the Difference? Do you prefer to sleep face up or face down? To put it another way, would you rather sleep supine or prone? Even if you would rather sleep on your side, it’s important to know that prone and supine refer to different lying-down positions. It can be confusing to remember which is which, but luckily, there is an easy trick to keeping them straight in your mind. That way, you can stop worrying about which word to use and go back to sleeping in your favorite position. 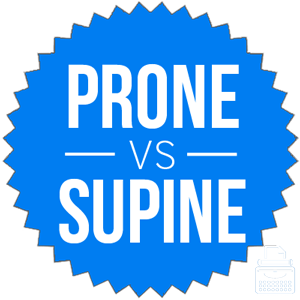 What is the Difference Between Prone and Supine? In this post, I will compare supine vs. prone. I will use each of these words in at least one example sentence, so you can see them in context. Plus, I will show you a helpful memory tool that you can use as a reminder of whether prone or supine is correct. What does prone mean? Prone is an adjective. It can mean more susceptible than normal, but in this article, I will focus on its other meaning: lying face down. If you are arrested, you might find yourself in a prone position as a result of complying with police directions. Some people find sleeping in a prone position comfortable, but others find that it makes it harder to breathe. When we found Jeimer, he was prone on the sidewalk, bleeding profusely from a head wound. When you are in a prone position, many of your vital organs are protected from attackers above you. Prone was first used in English sometime around the 14th century, and it originates from a Latin adjective that means bent forward. What does supine mean? Supine is also an adjective. It means lying face up. Many people sleep in a supine position. Superstitious people believe that if you find a supine penny on the ground, you will have good luck. Police found the aging rock star dead in a supine position, having overdosed on drugs and choked to death on his own vomit. A supine porcupine is the only safe porcupine to touch, as its underbelly is not covered in soft spines. Like prone, supine is also derived from a Latin adjective, but it wasn’t in use in English until the 15th century. Also like prone, supine has other definitions, one of which is failing to act or protest as a result of moral weakness or indolence. The supine Congress would not do what is best for the country. Both prone and supine are adjectives, and they each describe something or someone that is lying down. The difference is that prone describes the position of lying face down, while supine describes the position of lying face up. Since supine contains the word up, you can remember that when you are lying face up, you are in a supine position. Similarly, prone and down each contain the letter O, it should be easy to remember that prone means lying face down. Is it prone or supine? Prone and supine are adjectives that describe different ways one can lie down. Prone means lying face down. Supine means lying face up. Since they have opposite meanings, they cannot be substituted for each other; you will need to use the trick above to remember which is which. 1 What is the Difference Between Prone and Supine? No Later Than or Then? Which is Correct? Too Much or To Much – What’s the Difference?